Our weekend science fun was inspired by a book, Becoming Invisible: From Camouflage to Cloaks by Carla Mooney. Most children's books about camouflage talk about how animals try to blend into their environment. This book is very different. It is about how modern engineers and scientists are trying to make the fictional invisibility cloak from the Harry Potter books into a reality. For a review of the book and links to more science books, see our sister blog, Wrapped in Foil. Camouflage and invisibility are two very different things. Camouflage is the use of color or other aspects of appearance to help an object blend with its environment. “Optical camouflage” is a form of camouflage which uses projectors to display scenes of the moving background onto special reflective cloaks. From the right angle, it is impossible to tell where the cloaked person (or object) is standing because he or she seems to be part of the background images. If the viewer isn’t in line with the projectors, however, the illusion doesn’t work. Invisibility, on the other hand, is changing the way light reflects or refracts when it hits an object and thus preventing the light from reaching our eyes. We literally can not see an object that is invisible. Becoming Invisible: From Camouflage to Cloaks tells how scientists have been able to bend electromagnetic waves that are near relatives of visible light (see Exploring Light and its Relatives Part I and Part 2) with special man-made materials called metamaterials. Using metamaterials made of metal and fiberglass, scientists have been able to develop "cloaks" that bend microwaves and infrared light around an object, hiding it from detection. Very cool! Read one of the books suggested below to introduce the idea of camouflage. You might want to sort the children into teams if you are working with a large group. You will need enough swatches of fabric so that each child or team can hide a few different swatches. Make loops of tape with sticky-side out and then apply a few to the back of each swatch. Now select a child/team to be the hider. They will hide the swatch in plain sight in the play area by taping the swatch to items while the other children, who will be the seekers, close their eyes or wait in another area. When the hiders have applied their swatch, have the seekers come look for it. Once they have found it, change roles. The goal is to find a background object that matches the color close enough that the fabric is difficult to see, and thus takes longer to find. Art supplies such as markers, crayons, colored pencils, etc. 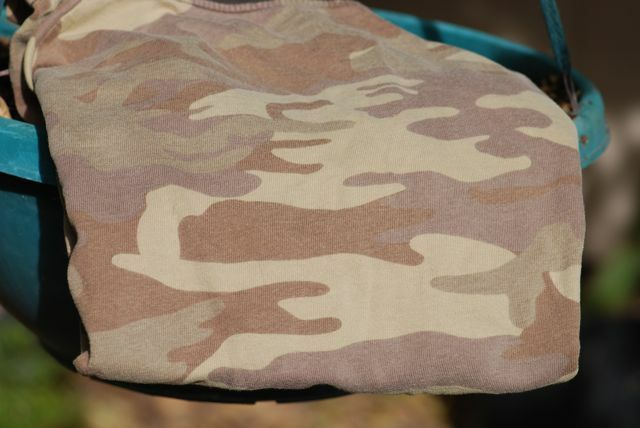 For older children, have them create their own camouflage patterns for different settings. You could also have the children do the hiding activity (1), but substitute their own designs on paper for the fabric swatches. Or figure out an experiment to test the effectiveness of various camouflage designs. Activity 3. Making glass "disappear"
We don't need high tech metamaterials to make an object invisible. We can hide a piece of Pyrex® glass by immersing it in a material that has a similar index of refraction, Wesson® oil. Place the smaller bowl inside the larger bowl. Fill them both with Wesson® oil, baby oil, or a mix of the two. Once covered with oil, the smaller Pyrex® bowl should disappear from view. Obtain some jelly marbles from science supply stores, for example from Steve Spangler. Soak the jelly marbles overnight in water. Then fill a clear glass container with water. When you drop in the soaked jelly marbles, they will disappear. Jelly marbles are polymers that absorb water. When they are swollen with water, they have the same index of refraction and disappear when you place them in water. If you try any of these activities, be sure to let us know what you find out. How to Hide a Butterfly and Other Insects (Reading Railroad) by Ruth Heller.